Saturday July 12th 1890 We done sweeping and baking this forenoon. Winnie mowed the yard and the boys pulled the weeds out of the garden. Mother went to town in the afternoon and I was doing mending to finish the weeks work. Sunday July 13th 1890 It was a very warm morning. Will and I went up north of town to look for a bohemia girl. We stopped to see how Fanny was and then went out to the pasture. Will had to look for the cattle and it was twelve oclock before we got home. I read all afternoon. Monday July 14th 1890 We got an early start and washed and ironed both before noon. Mother went to town soon after dinner to go down to Henry & Ella Birds tin wedding tonight with John & Hatt. I done the mending and cut out a waist for myself. Will come in about four oclock and we got ready to go. I got a cake pan for Ella a present. We had a splendid time. 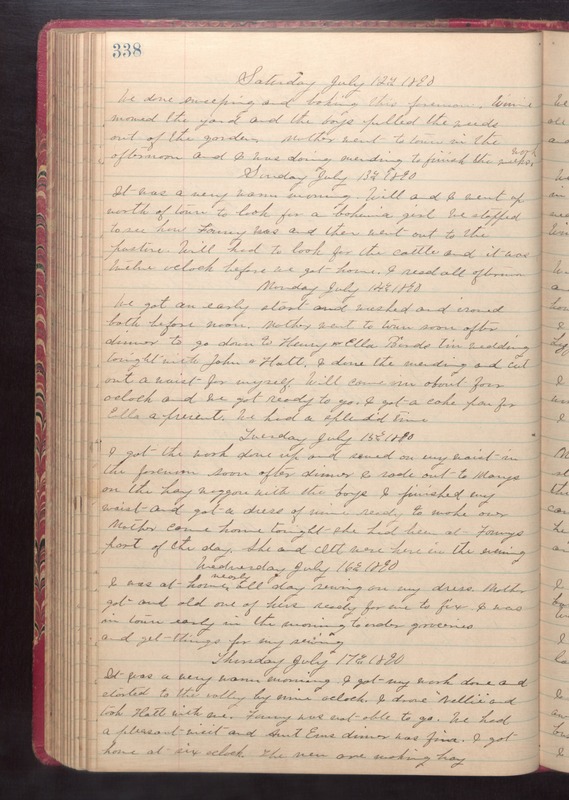 Tuesday July 15th 1890 I got the work done up and sewed on my waist in the forenoon soon after dinner I rode out to Marys on the hay waggon with the boys. I finished my waist and got a dress of mine ready to make over Mother came home tonight. she had been at Fannys part of the day. She and Ott were here in the evening. Wednesday July 16th 1890 I was at home nearly all day sewing on my dress. Mother got and old one of hers ready for me to fix. I was in town early in the morning to order groceries and get things for my sewing. Thursday July 17th 1890 It was a very warm morning. I got my work done and started to the valley by nine oclock. I drove "Nellie" and took Hatt with me. Fanny was not able to go. We had a pleasant visit and Aunt Ems dinner was fine. I got home at six oclock. The men are working hay.